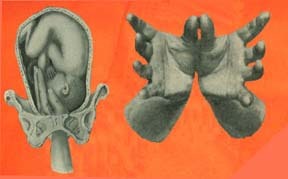 To hasten the progress of prolonged and difficult labor, the midwives of the earliest times often felt the desire of being able to hold the head of the child between their hands. However, the human hands are too thick and large. Thinner and slimmer, the obstetrical forceps were used, which are in reality nothing else than a pair of iron hands. In 1813 by a fortunate accident, several obstetrical instuments were uncovered at the estate of Woodham Mortimer Hall, near Malden, in Essex, which was owned by Dr Chamberlen (third generation), until 1715. From the fashion of these instruments may be traced the development of the Chamberlen's forceps. The obstetrical forceps was devised on the late 1500 A.D. to the beginning of the 1600 by a member of the Chamberlen family. 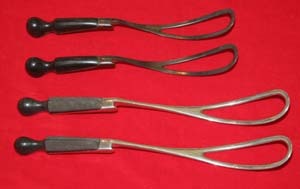 The forceps was kept a family secret for four generations. 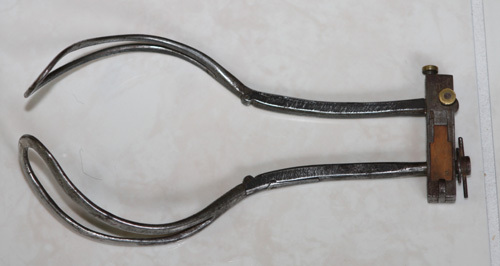 Little was known of the forceps up to the second quarter of the 18th Century. 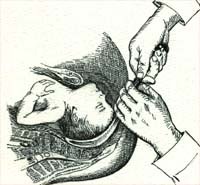 No method other than the podalic version (insertion of the operators hand inside the uterus and grab one or both feet of the baby and pull the infant out), was available mechanically to assist the delivery of a living child. 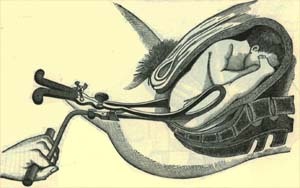 So many babies were lost or maimed and countless mothers perished from exhaustion, hemorrhage and infection before the advent of the obstetrical forceps. The forceps continue to save babies and mothers up to the present time. It must be one of the most important inventions in medicine. Double blade connected together with a riveted joint, and scissor like handles. 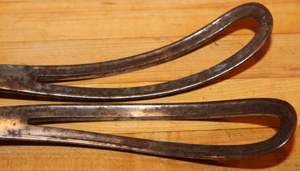 Double blades with hooked handles in which the joint is formed by a loose pivot on one blade, and a hole in the other to receive it. The most advanced of the Chamberlen's forceps. Both blades had a hole at the joint through which is passed a string to connect the blades. The string is tied around the joint to make it fixed. The Chamberlen forceps was a straight, short and have the the cephalic curve only. It is approximately 28 cm (11 inches) long. 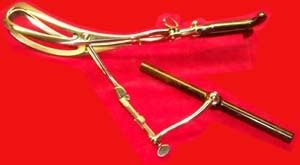 Levret of France in 1747 and Smellie of England in 1751 independently of one another added the pelvic curve to the obstetrical forceps. The pelvic curve of the forceps. Designed to accomodate the maternal pelvic curve. The cephalic curve of the forceps. Formed to embrace the fetal head. 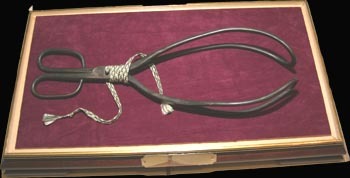 A cased facsimile of the most advanced of the Chamberlen forceps. A perfectly cast from the third pair of the original Chamberlen forceps held at the Royal College of Obstetricians & Gynecologists and is one of a limited edition of 250. Obstetrical Forceps Locks There are several system where the obstetrical forceps lock the two blades. Illustrated below are the major locks to permit ready articulation and hold the blades together. Introduced in 1752 Consists of a socket upon each branch into which fits the shank of the other half of instrument. The notches in each stem fit together to lock the instrument. 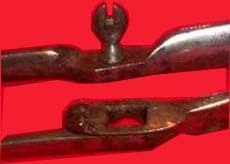 Introduced 1747 A revolving thumb lock that is inserted into a slot, then turned to secure the blades into position. 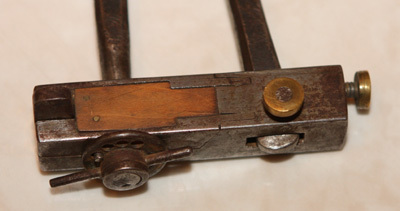 Introduced 1804 A modification of the French lock. A pivot is screwed into the shank of the left branch, while the right presents an opening which can be adjusted to it, the screw being tightened after articulation. German Lock The shank of the left branch bearing a pivot with a broad, flat head, while the right is provided with a notch which corresponds to the pivot. A single blade to extract a living child. It is used as a lever or a tractor or an artificial right hand. 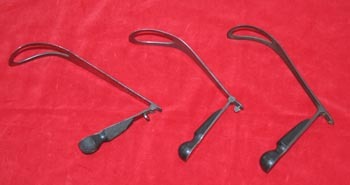 It is also called the lever or extractor Three of four fingers of the left hand act as antagonist. The use of the vectis is illustrated. The vectis is hinged. Unplated steel with ebony handle. 30 cm (11 3/4") in dimensions. 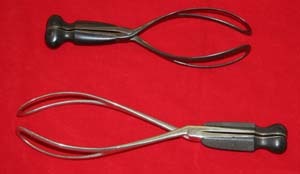 Like the Chamberlen forceps, both pairs of forceps have the cephalic curve only, but no pelvic curve. The short forceps have smooth ebony handles, English lock unplated steel blades. The long forceps is the Denman's forceps. It has ribbed ebony handles with notched end, unplated steel blades with English lock. 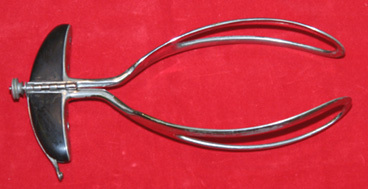 c 1750s In 1747, Andre Levret of France applied the first pelvic curve on the obstetrical forceps. He also introduced the French lock to hold the blades together. The fetal side of the blades are grooved. Unplated steel with hooked handles. c 1800s Introduced by English Surgeon William Smellie in 1752. It contained the most advanced obstetrical lock, the English lock. Smellie together with Andre Levret added the pelvic curve to the blades of the forceps. Unplated steel with ebony handle. The notches on the handle are to be bound together by a tape to hold the blades together. See Bennion, pg 119, No 7, Ch 6. L. Hamond constructed a more complicated mechanical tractor than his earlier model used with his retroceps. 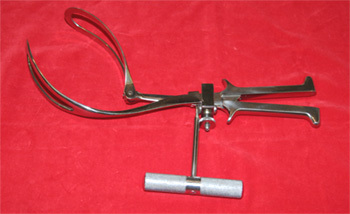 The two crutches (missing) pressed in the genitocrural fold and a long screw with a cranked handle. See pg 155 Fig. 11.14 The Obstetricians Armamentarium, Brian Hibbard, Norman Publishing, 2000. Circa 1792 It is a short forceps with a pelvic curve and an English lock. The right hand blade has a hinge between the handle and blade, by which it is easily introduced while the patient lies on her left side. It has a distinctive upward curve to both fenestrated blades. The value of the hinge was unknown. It may just be the craze of the time. Unplated steel with ebony handles. 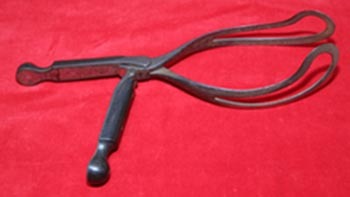 Circa: 1782 Short, straight forceps without the pelvic curve. It has broad blades, wide parting shanks. Designed by David Orme, M.D. of Edinburgh, and William Lowder, M.D. of Southhampton. 28 cm (10 3/4") Das p220 Fig 244. Spoon and Fenestrated Blade Forceps. With the male spoon, and female fenestrated interlocking blades. Unplated steel with ebony handles. Checkered ivory handles with upturned knobs at the end. Unplated steel blades marked: J. GRAY & Sons, Sheffield. Circa: 1850s Unplated steel, hooked handles and French lock. Fetal side of blades not grooved. 48 1/2 cm (19") in length. Circa 1848 Only 4 cm (2 1/2 ") long handles, lined with a very thick and convex layer of checkered ebony; no palm rest and no finger rest, and no pelvic curve. Unplated steel, 24 cm (9 3/4") in length. 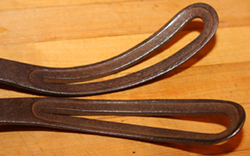 Often called "retroceps' forceps, meaning behind the head. The blades were placed behind the head and it articulates on a common transverse handle. The right shank revolves. It serves more like a lever and never had a practical usage. To avoid compression to the fetal head, the Elliot forceps provides a sliding pivot on the handles to keep it at a desired distance apart. Ebony handle, uplated steel. Traction on the handle guides the operator the precise direction of the pelvic axis. Unplated steel blades, horn covered handles, double connecting rods attached to the side of the blades. The traction device has an ebony handle. Bar marked Collin, Brevete SDGD. Fig 3779, Tiemann. Unplated steel with finely ribbed removable handles. It has hooked ends and Siebold's lock. Marked Mathieu A. Paris. Length: 47 cm. 1987 Keith Wilbur, Antique Medical Instr. p104. 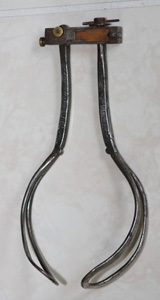 Circa: Mid 1800s Consists of two parallel forceps held together by pin and socket cross bar. The idea is to apply traction to the fetal head without compression..All metal unplated steel. 42 x 18 cm . 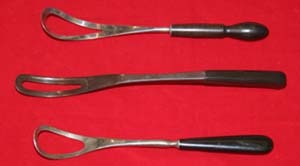 Plated steel parallel forceps similar to Boerma. The rib handles are interconnected with a round joint at the base; they have small protrusions on the ends for grip; hallmarked with a crowned caduceus. 10 5/8" long, 1907 forceps described in Das p683. 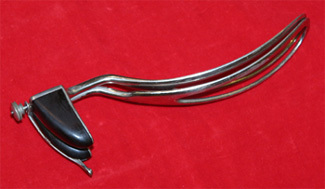 A rotational forceps introduced in 1925 by Lyman Barton of New York . The blades join the shanks at an angle. One of the blades is hinged. This ob forceps has a sliding lock with a cross bar handle axis-traction attachment. The handle have a finger rest. Another rotational ob forceps, supposedly an upgrade to the Kielland's forceps. It has a sliding shanks with a lock. The handles have a finger rest and a spacer that can be adjusted with a winged knot. The blades have 4 round fenestrations on each side.